Put the eggs in a large pot filled with enough cold water to cover them. Place over high heat and bring water to a boil, turn down to low and let cook for 15 minutes. Remove from the heat and put eggs in ice water for about 12 minutes. 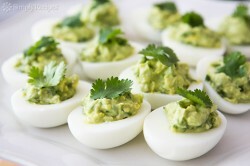 Tap the eggs all over to crack the shells, after they have cooled down a little, then return to the cold water. Brown the pine nuts in a hot dry skillet for about 2-3 minutes. Set aside and until cool. Put the basil, toasted pine nuts, parmesan cheese, garlic, salt and pepper in a food processor and pulse until a rough paste is formed. With motor slowly running, slowly pour the olive oil through the feed tube until all of the ingredients are well combined, scrapping the sides of the bowl as necessary. Taste to see if you need more salt and pepper. Set aside. Peel the eggs and cut in half, length-wise. Carefully remove the yolks from eggs and put them in a medium bowl. Mix yolks, 2 heaping Tablespoons of the pesto and mayo until well combined. Add more pesto, after tasting, if you like. Add more salt and pepper, if necessary. If it seems too dry, add more mayo. Spoon or pipe the mixture into the hollowed out egg whites. Garnish the top of each egg with a few pine nuts, a dollop of the pesto, and small basil leaves. Cover with plastic wrap and keep in the fridge until ready to serve.